Hasan Yasien is STILL stuck in Moscow Sheremetyevo airport. Published on April 19, 2016 by Wade Shepard Follow me on Twitter here. 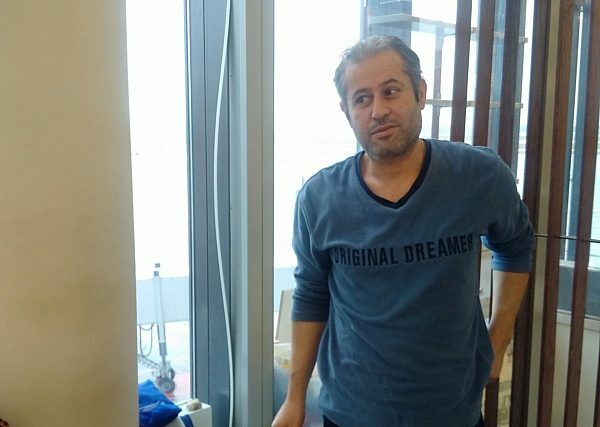 Hasan Yasien is still stuck in Moscow Sheremetyevo Airport. He’s been trapped in the transit zone for over eight months now, unable to go forward or backward. He spends his days sitting on a mat that is splayed out next to his tent as passengers scurry around him going to and from their flights. I first met Hasan in November when I was traveling through Moscow from Kazakhstan. I had a layover at Sheremetyevo and I noticed something that 16 years of travel told me shouldn’t be in an airport: a camp of refugees. They made their home inside of a glass enclosure that looked as if it may have once been used as a smoking booth. They had all of their worldly possessions spread out over the floor; they had a little sign saying “Please don’t touch our things, we live here.” At that time, there was a family of five from Syria, a couple from Afghanistan, and Hasan, who was also from Syria. They all had been there for more than a while. All over the world, people are being trapped in territorial limbo within these transit zones with little legal recourse available to them — they can’t get into the country, they can’t go back to where they came from, and, in some cases, there isn’t anywhere else for them to go to. In Hasan’s case, he legally entered Russia on a work visa and applied for longer term residence, which was eventually rejected. He then tried multiple times to leave the country on his own volition and with his own funding. Two times he flew to Turkey, one time he flew to Lebanon, and on each occasion he was denied entry and shipped back to Russia. He has been stuck in the airport for over eight months now. Since I last said goodbye to Hasan, shook his hand, and walked off my flight, I’ve been with my family, I’ve been to seven countries, I’ve freely gone where I wanted, and did what I’ve wanted to so. Every once in a while when doing something particularly enjoyable or when I find myself someplace nice, Hasan pops into my head. I’ve done all these things and have gone to all of these places and he’s still sitting on his mat next to gate 36 in terminal E, all alone, under-nourished, unwashed, and, oftentimes, cold. Hasan isn’t a criminal, he’s not even an illegal immigrant. He is not one of those refugees trying to crash into Europe by force or sneak in by guile. He’s just a guy who fled war in his home country, took a job with a Syrian factory in Moscow, was told that he could no longer stay in the country legally, so he tried to leave. Then he got stuck in this extra-territorial purgatory. Although Hasan has met with representatives from the UN High Commission for Refugees and other human rights organizations, they’ve done very little to help him get out of the airport. So he sits there, waiting, waiting, waiting. However, there is one small bright spot, if it could be called that. Sometimes these readers send me emails to tell me about their experience meeting Hasan; he has unwittingly become one of Sheremetyevo’s main attractions. In my opinion, talking with this soft spoken man beats sitting around in Burger King, gazing slack jawed at the ridiculous prices of the duty free shops, or shopping for yet another “Putin goes to Crimea” t-shirt while waiting for your flight to board. I chat with Hasan from time to time via Whatsapp. He is open to all outside correspondences from people interested in helping or from those who just want to talk. You can connect with Hasan on his Facebook page. I’m not sure where to appeal to on behalf of Hasan. Russia’s ears are closed, and there are probably few other countries willing to go the distance to help out one guy stuck in an airport far away. So I put out these missives with the hope that they land in front of someone a little more useful than I. (Attn: friends who work in the foreign service).